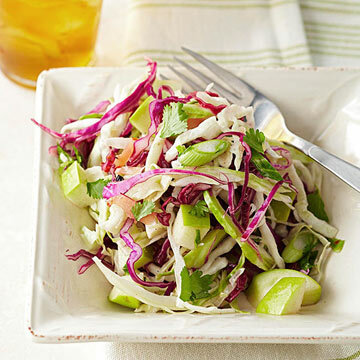 Serve this low-fat, lightly dressed cabbage slaw as a side dish for grilled burgers, chicken, or fish. Rinse red cabbage; pat dry. In a large bowl, combine red cabbage, green cabbage, apple and green onions. For vinaigrette: In a screw-top jar, combine vinegar, oil, cilantro, pickled ginger, soy sauce, ground ginger, celery salt, red pepper flakes, salt and black pepper. Cover and shake well. Drizzle the dressing over salad; toss gently to coat. Cover and chill for at least 1 hour or up to 3 hours. Make 6 side-dish servings.